← Pregnancy Ultrasound is Awesome. I’ve been very happy with the modern methods we use in our office for more and more procedures that used to require going to the hospital and having major surgery with general anesthesia. It’s amazing that we do procedures every day that did not exist a few years ago. Our practice is much better as a result. One of the greatest improvements has been in permanent birth control, or what we used to call “having a tubal.” The previous procedure used to cause pain as we inserted a scope through the patient’s navel, and there was some risk involved with hitting a blood vessel or a hidden abdominal structure. Then there would be cauterizing the patient’s tubes, with the risk that the cautery could be too much or too little, which could result in an injury or a pregnancy, respectively. While a permanent birth control method is not for those who are still planning to have children, there are many people who are definitely not planning to ever become pregnant in the future and don’t want to have to depend on birth control pills or other methods that require a lot of effort or cost. Today we are pleased to offer and perform the Essure in-office procedure which accomplishes the same objective in a better, safer, quicker, and less painful way. The Essure is a tiny insert made of a flexible nickel-titanium polyester alloy that we place inside the uterus where the tubes are attached to it. This area is very narrow, only about 1-2 millimeters in diameter (see the picture). To accomplish this we give the patient 4 kinds of oral pain medication (which we call a cocktail) that is taken before coming into the office. We then give additional pain medication as a shot and also we give local anesthesia for the cervix. A tiny instrument which is the insertion device is gently placed through the cervix. So there is no cutting, no scar, and hardly any pain or bleeding. This gives us a view from within the uterus, and we look up to see the tiny openings at the top where the tubes meet the uterus. We place the tiny device in first one side, and then the other. The procedure is done. It usually takes about 15 minutes total time for both sides to be completed and does not hurt more than having a period. 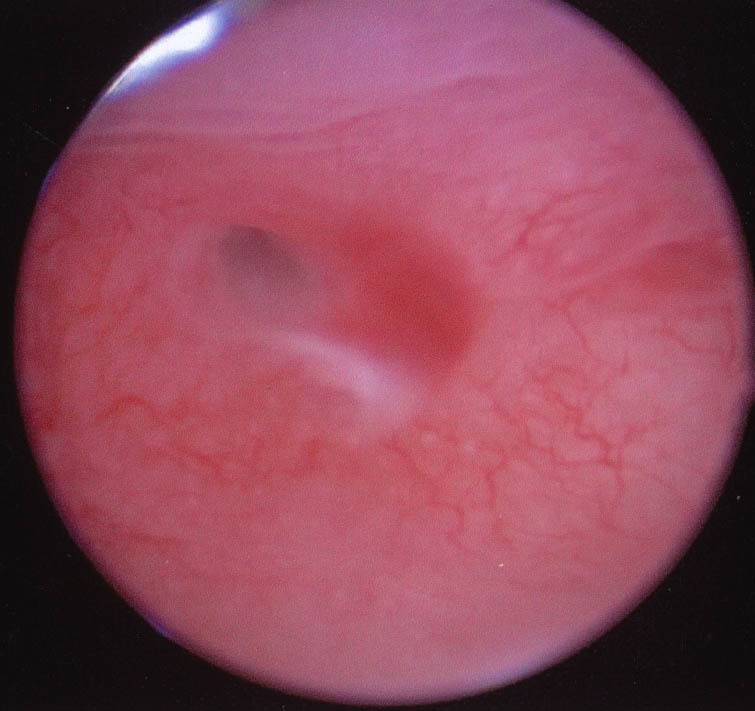 The opening of the right tube seen as it enters the uterus. During the next 3 months each tube where the device has been inserted becomes blocked. We confirm this by doing a tubal dye test, and we get a report that shows a successful placement and successful blockage of both tubes. 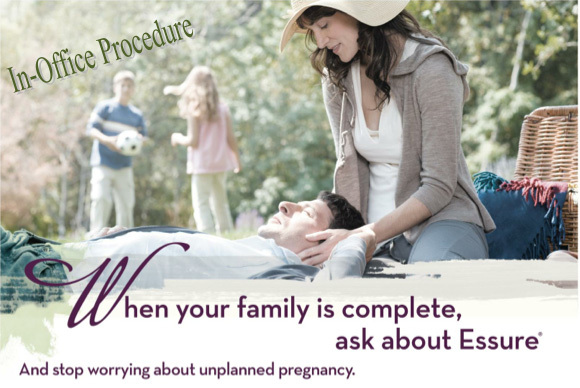 Not only is the procedure easy to do, but the results confirm it has worked before we advise patients to stop using birth control. The end result is a very convenient, safe, and effective method of having a permanent birth control with no cutting, no scar, and very little cost. As it is done in the office, there are no hospital charges for the person or for the insurance company. We have been performing the procedure in our office for several years now, and the results have been great. If you are done having children, you should definitely consider having a permanent method that is so safe, easy and effective as this. This entry was posted in Our Office and tagged birth control, Essure, permanent birth control, tubal ligation. Bookmark the permalink.